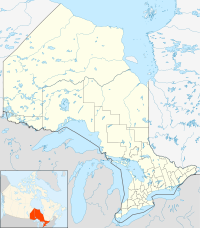 Thunder Bay is the most populous city in Northwestern Ontario, in Canada. Its population was 107,909 as of the 2016 census. Before, it was two cities called Fort William and Port Arthur. Thunder Bay has the second largest population in Northern Ontario, behind Greater Sudbury. ↑ "Canada's Gateway to the West". Port of Thunder Bay. Retrieved December 3, 2018. ↑ Smith, Jamie. "Norm Gale appointed city manager at city council meeting Monday," TB News Watch (January 11, 2016). Retrieved January 10, 2016. ↑ City Hall, Thunder Bay City Council. Retrieved June 2, 2007. ↑ Municipal Code, by-law 218-2003. Retrieved June 2, 2007. ↑ 5.0 5.1 "Thunder Bay, Ontario (Code 3558004) census profile". 2011 Census of Population. Statistics Canada. February 8, 2012. Retrieved April 25, 2013. ↑ 6.0 6.1 "Thunder Bay (census metropolitan area) (Code 595) census profile". 2011 Census of Population. Statistics Canada. February 8, 2012. Retrieved April 25, 2013. ↑ 7.0 7.1 "Thunder Bay (population centre) (Code 0935) census profile". 2011 Census of Population. Statistics Canada. February 8, 2012. Retrieved April 25, 2013. ↑ The Port of Thunder Bay, The Transportation Sector. City of Thunder Bay. Retrieved November 30, 2007. ↑ "Canadian Climate Normals 1971–2000". Thunder Bay A, Ontario: Environment Canada. January 19, 2011. Retrieved April 12, 2012. This page was last changed on 5 April 2019, at 11:04.